Candidates must provide valid personal information in test registration. The test organizer reserves the right to cancel the candidate’s score if information provided is found invalid. Candidates must arrive on time as requested. Candidates who arrive late after the test has started are not allowed to enter. When entering, candidate will be asked to provide the admission ticket, and the valid ID . Chinese mainland candidate must bring the second-generation National ID, Passport or Military ID; Hong Kong and Macao candidate must bring the Hong Kong and Macao Resident Identity Card or Passport; Taiwan candidate must bring the Mainland Travel Permit for Taiwan Residents; Foreigner must bring Passport. The valid ID listed above accepted by TOEIC Test must be original and be current (Not expired) with a recognizable photograph. When entering, candidate's ID type must be consistent with the ID provided during registration. Candidate who fails to provide the admission ticket, valid identification or a matched photo will not be admitted. Candidate with fake identification and impersonated candidate will be prohibited to participate in any TOEIC Test in 5 years. After entering the test room, candidates must place the identification on the desk for inspection. Except Identification, all other personal belongings should be placed in the designated area in the test room. Do not bring valuables into the test room. The test organizer is not responsible for personal belongings lost during the test. All cell phones, PDAs, and other electronic devices must be turned off before entering the test room. Turning on or using cell phones or other electronic devices is forbidden during the test. If it is found that any candidate has not turned off any electronic device(s) during the test, his/her test score will be cancelled. Candidates are not allowed to leave the seat until the administrator instructs to do so. Those who are not able to continue the exam due to special reason will be asked to wait in the administration office and allowed to leave after the test is finished. We reserve the right to further investigate, punish, or even cancel the score of the candidate(s) who is/are caught cheating during the test. For cheating or suspected cheating behavior found after the test, we have the right to investigate the candidate(s) involved and suspend to release his/her score or cancel his/her score already released until the investigation is completed. Candidates should be cooperative. We have the right to cancel the score of the candidate if he/she is not cooperative in the investigation. The administrator will provide on-site solution according to the TOEIC Test administration regulations if any accident occurs during the exam. Objections must be raised before the solution is implemented, or else, candidates shall be deemed to have accepted the solution and take the consequences related; Complaints regarding the accident and solution are not accepted if candidates have accepted the on-site solution. Candidates who are found taking test materials out of the test room will be held liable and prohibited to take any TOEIC test in 5 years. Before, during or after the test, the test organizer has the right to check the personal profile of any suspected proxy tester as well as submit it to third-party identification bodies such as public security organizations, and act against the disciplinary offences based on the identification results. All candidates should cooperate actively with the test organizer on any activities regarding investigating cheating of any kind during the test. 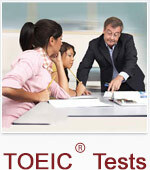 TOEIC test organizer reserves the right to act against any disciplinary offences of the candidates. Everyone has the right and obligation to maintain the fairness of TOEIC test. You are welcome to report violations of any kind that are against the Test Regulations. ETS, the ETS logo, TOEIC, TOEFL and GRE are registered trademarks of Educational Testing Service (ETS) in the United States and other countries, used in China under license.